One of the great mysteries many of us address in life is how we ended up where we are. What decisions did we make that set us down a certain path? Was it nature or nurture, luck or planning? My path toward my present life focusing on human and natural history in Seattle was one that I started very early in life. The other day, friends hosted a baby shower and requested that we bring our own baby picture. Looking through a scrap book my parents put together, I quickly found the picture I wanted but then got stuck reading through old report cards. I was able to confirm what my mom had told me when I graduated from college: “David, you never stopped talking in school.” Apparently I disturbed the other children, did not always pay attention, could be a bit too enthusiastic, and didn’t always read tests carefully. Oh well. But then I came to my third grade report card, written by Ms. Bangs, who I remember as a gray haired, elegant and nice, older woman. I don’t remember much from the class, though I can still picture the room on the second floor of Isaac I. Stevens Elementary School. At the time my father worked at the University of Washington and his boss was Brewster Denny, Arthur Denny’s great grandson. (I mentioned an interview with Brewster in my book, Too High and Too Steep.) According to Ms. Bangs, Brewster also wrote a letter for, or to, me. Unfortunately, I don’t have a copy. Nor is there a copy of it in his papers in Special Collections at the University of Washington. 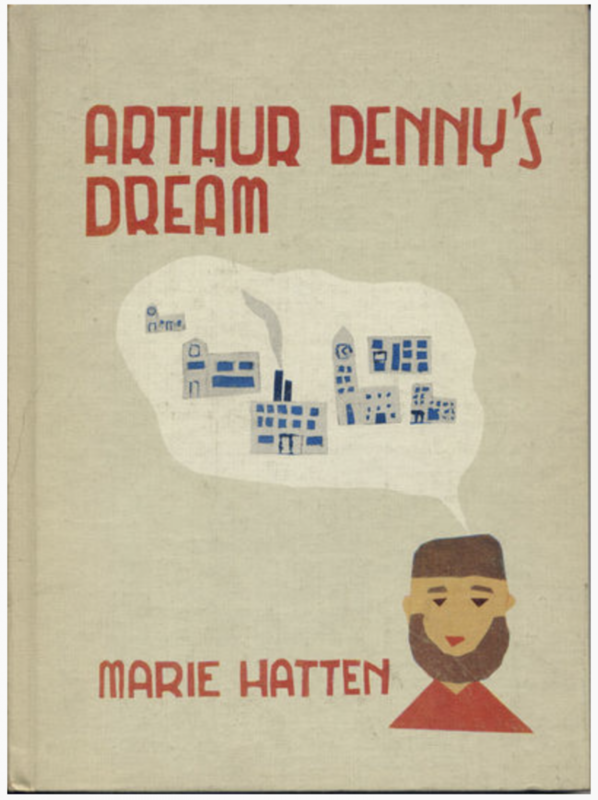 She also noted that we read Arthur Denny’s Dream, which of course I have no recollection of doing but with the power of the internet, I found a copy and bought it. 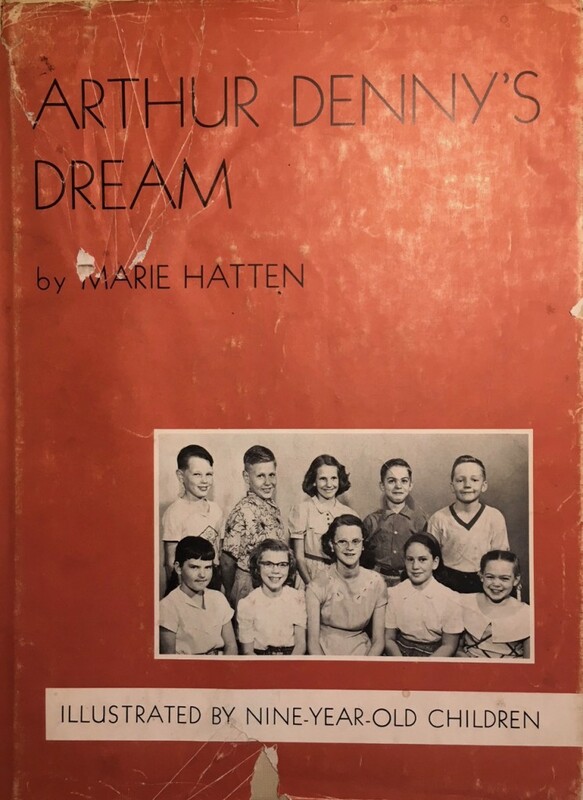 The book was written in 1953 by Mrs. Marie Hatten, a fourth grade teacher at Fairview School, and illustrated by ten of her students. 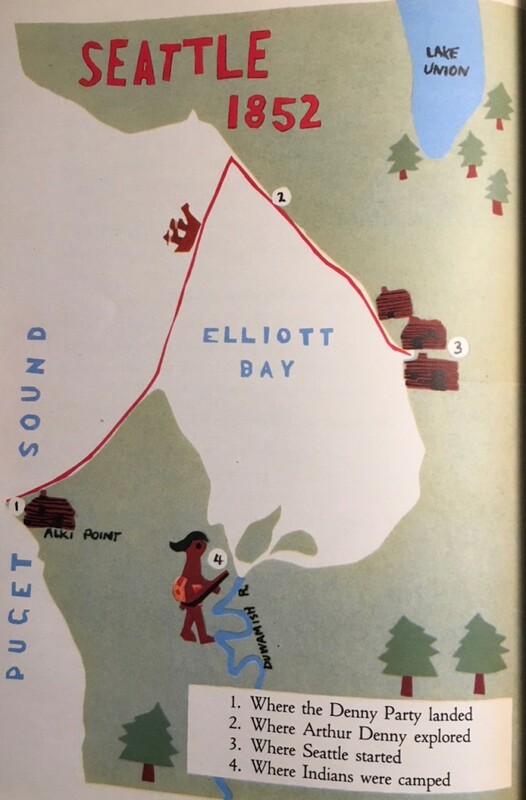 Using Four Wagon’s West, a book written by Arthur Denny’s granddaughter, Roberta Frye Watt, as a guide, Hatten’s students drew pictures with crayons, which they later modified with colored paper. Hatten then typed a story to go with the pictures. The book tells the story of Arthur, his wife Mary, and their two children, and how they traveled west by wagon. Joined by Arthur’s four bachelor brothers and several other family members, they killed a buffalo, carved their names at Independence Rock, caught fish, and had some issues with the Native inhabitants along the way. As one might imagine for a book of its era, it is racist toward the Indians that the Denny’s met enroute and in Seattle. What also stands out is the creative artwork. 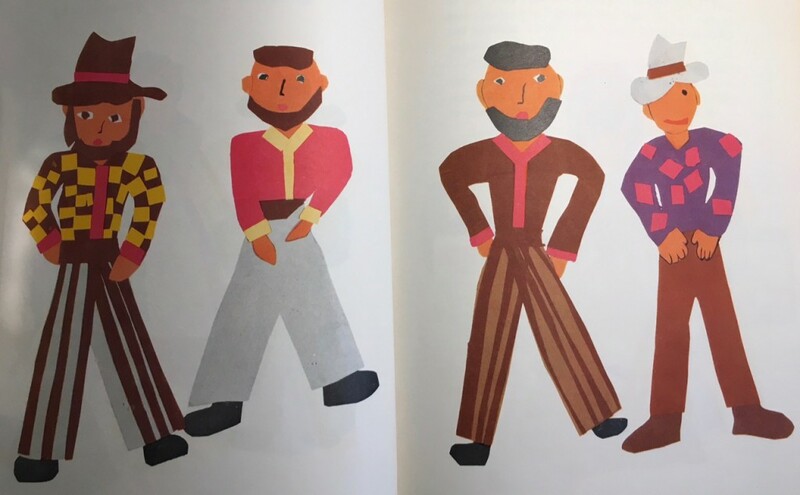 The illustrations depict the four brothers and the Mercer Girls. But back to my report card, where Ms. Bangs added that amazing line. 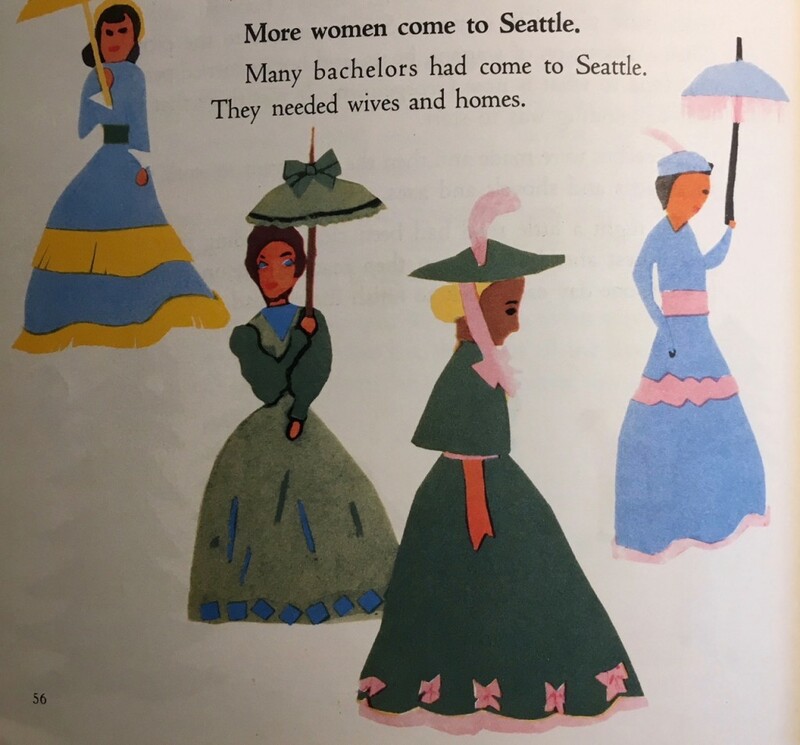 “I’m glad David shows such an interest in Seattle history.” Wow, who knew that the path I now trod started so early in life. 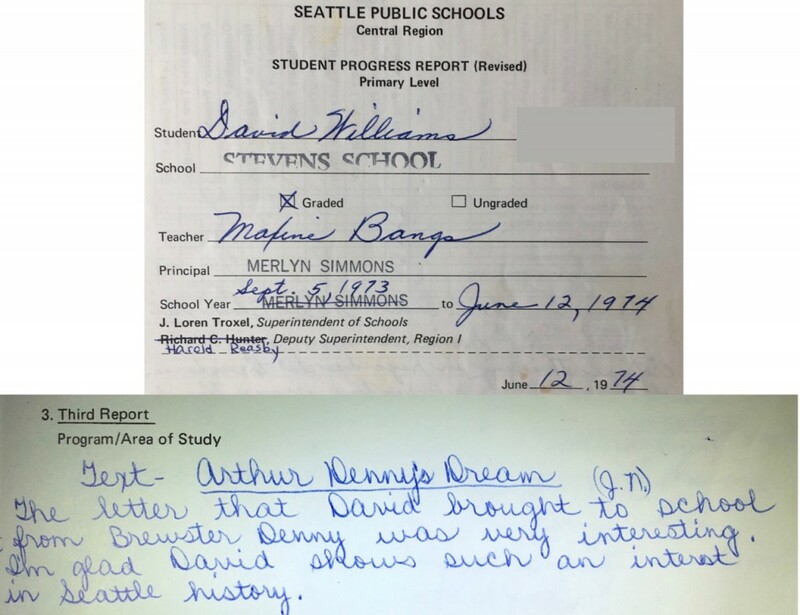 Unfortunately, Ms. Bangs died before I wrote my first book about Seattle history but I like to think she would have been proud of what her somewhat rambunctious, often distracted and distracting student became.